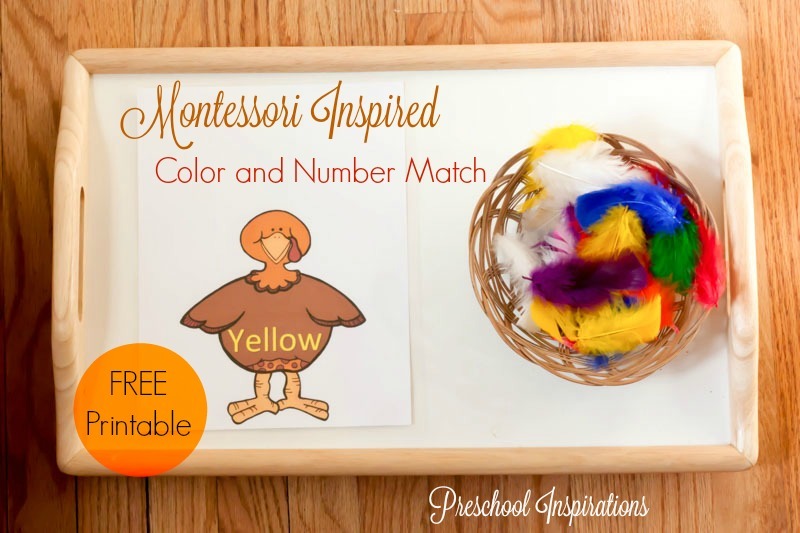 Practice some of the most foundational math skills with this fun and inviting turkey color and number match Montessori inspired activity. I’ve included a free printable so that you can set this up in a breeze! What a perfect addition this would be to a math center for hands-on learning! It is designed for younger children and older children, so whether a child is working on colors, numbers, or simple addition, you will be able to recreate this simple color and number match invitation to play. After you have printed out this free printable, all you need is some multi-colored feathers! They are usually widely available year-round in craft stores. We look for nearly any excuse to use feathers because they are so soft and a perfect material to help children practice being gentle and careful. 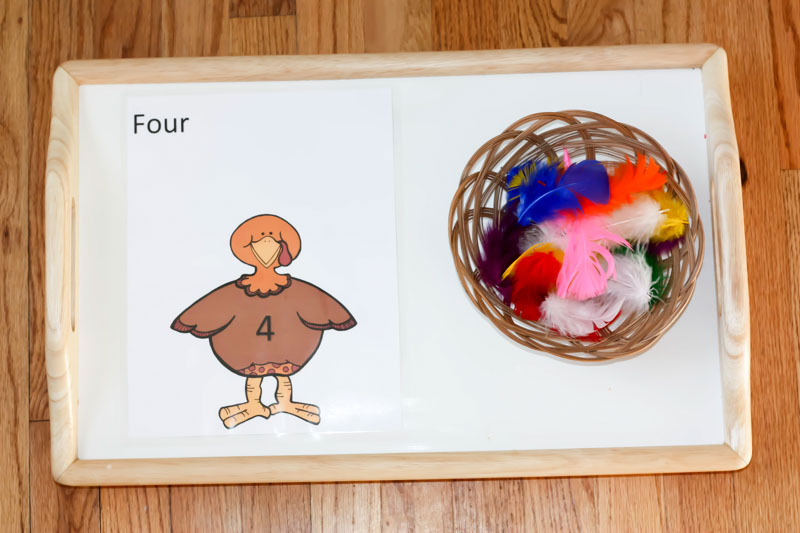 Since this is Montessori-inspired, feel free to add a basket to hold the feathers. I love using a Montessori tray or activity trays to give the activity a “home” and to make it easy for the child to put on a shelf or a table. I recommend laminating this for extra durability. This is my favorite laminator, and I just buy inexpensive laminating pouches, which work perfectly for anything you use with children! Just click this link for the turkey printable download! 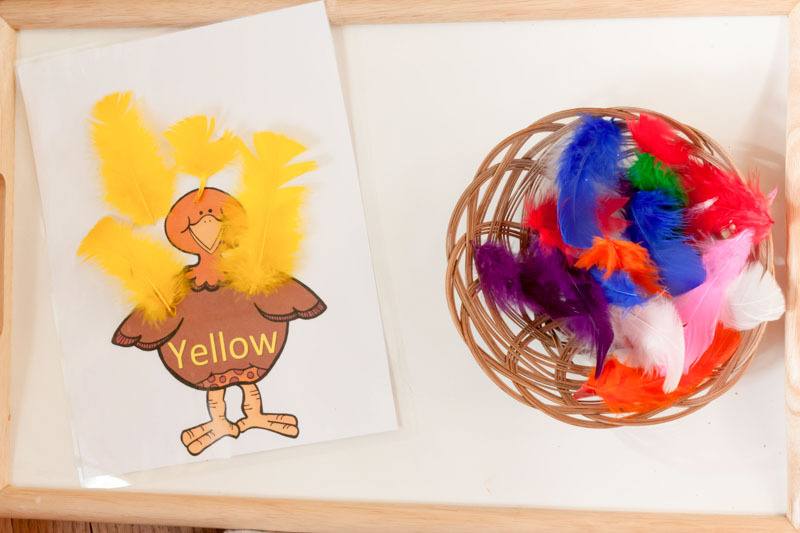 With this color game, your child can practice color matching, and how fun would it be to add different hues of the color if you have a good feather variety. 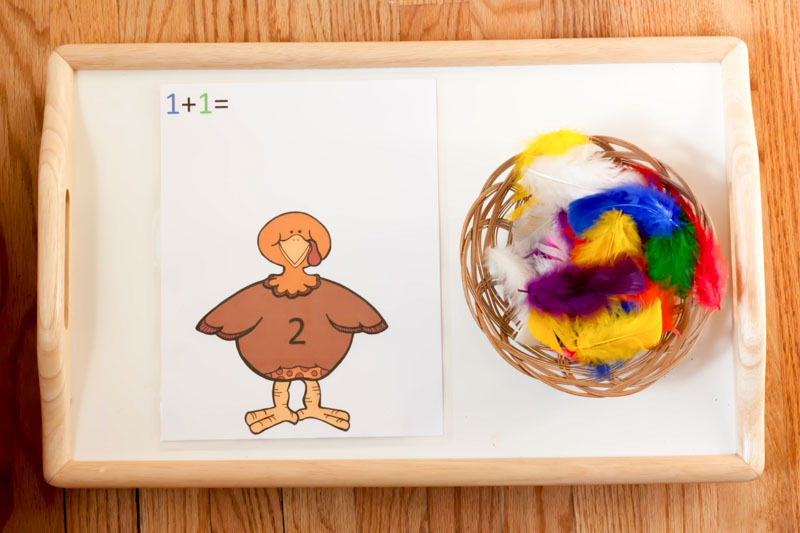 Next, there is a number identification turkey printable game. This one helps reinforce numeral recognition as well as quantity, and the written word is above for older ones to help associate the two! While we did this, my daughter grabbed a dry-erase marker and began writing on one! Don’t children think of the best ideas!? Anything that is laminated is an instant perfect dry-erase surface! I hope you and your children enjoy these while working on math skills at the same time! Cute idea! But, I can’t seem to find the links for the downloads. I’m so glad you mentioned that, Heather! Apparently it didn’t publish with the download link, oops. All fixed now. It’s a big long link in the middle of the page now :). Thank you again!! Thank you 🙂 I think it’s adorable! Hi, I found this on Pinterest and think its super cute! Just had a quick question about laminating: if you use a letter size laminating pouch and then cut the paper into pieces, does the lamination stick to it? Thanks! Typically they don’t stick because you are cutting the adhesion of the laminated page.